John Pollock and Wai Ting review WWE SmackDown from Wichita, Kansas. 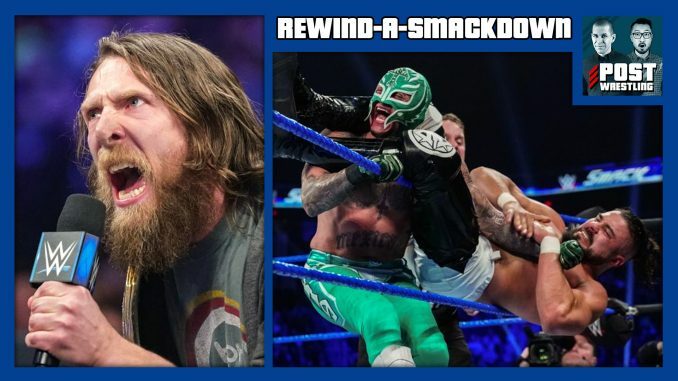 On the final show before the Royal Rumble, Rey Mysterio took on Andrade in a 2-of-3 falls match in the main event, Daniel Bryan and AJ Styles had a face-to-face segment with Bryan’s feelings on the baby boomer generation revealed, Shane McMahon and The Miz are attacked before Sunday’s tag title match, Asuka and Becky Lynch brawl, and the latest chapter in the saga between Naomi and Mandy Rose. NEWS OF THE DAY: Sports Business Journal’s report on the XFL’s talks with Fox and ESPN, an update on Flip Gordon’s knee injury, the commentary pairings for the Royal Rumble & more. John Pollock reviews the June 6, 1992 episode of WWF Superstars featuring Gene Okerlund’s interview with Papa Shango, Vince McMahon promoting the first WBF pay-per-view & more.